The biggest console release of the year is still months away, but already we know one of Project Scorpio's launch games. Let's just say, it has a distinct Tolkien flair. Middle-earth: Shadow of War by Monolith Productions was revealed last week as the first confirmed title for Microsoft's forthcoming console. Project Scorpio is a brand-new, next-gen system, so naturally there were some jitters and kinks to work out from a game development standpoint, right? "We've been launch games on next-gen systems since the [Xbox] 360," Matt Allen, director of technical art at Monolith, tells TechRadar. "Launch titles don't scare us at all." Allen describes Monolith and Microsoft's working relationship as "fantastic" – both are based in Seattle, for starters – but what about the actual Project Scorpio hardware? "So far, we really like it," Allen says. "I don't know how much they've revealed the specs, but it is an upgrade. It's not just sort-of, 'We're going to upgrade some stuff.' There's things you can do with it. So, we're pretty excited to be working with them specifically." If there's one feature Allen has to pick when it comes to defining Project Scorpio as a great system to make a game for, it's as easy as three letters. "HDR," he immediately offers. "Until you've seen the game at 4K and HDR, it's a different ... you can watch it [in HDR] for a while, and after seeing it for a couple of months, you normalize it. Then you go back to not looking at it [HDR], and it actually is really different." "I don't know how much consumer uptick is going to be of 4K HDR TVs, but we've got a couple, and the game looks fantastic," Allen adds. "For me, I'm really excited about showing it off at some point. Hopefully in the near future we can show that off." Fans of the first game, Shadow of Mordor, and newcomers alike will no doubt savor Shadow of War's epic-ness, both from a story and technical standpoint. Allen says that with Shadow of Mordor, Monolith had its head down on nailing the game. With Shadow of War, the team was free to flex their technical muscles, too. "We have a new renderer that we did, a new facial animation system, a new core animation system. We really picked a lot of things and started to go crazy," he says. "It's basically a full upgrade of the engine." "The last game we really just focused on the game, but this one we knew what we were doing from a game standpoint, and then the engine guys were like, 'Alright, can we show off a bit?'" This engine upgrade and Shadow of War's other souped up features are due in large part to Monolith's in-house engineering capabilities – like having "a machine shop in the basement," Allen says. "I've been with Monolith for 20 years, and obviously people make the game, but we've dogmatically always wanted to have our own technology, and I think that has allowed us to be flexible and agile and take advantage of stuff at the drop of a hat." This approach served well in developing for Project Scorpio. "Another thing with having our own technology is when Microsoft comes to us and says we're really pushing HDR, we can look, get my engineers together and be like, this is a thing. This is pretty straightforward to do." 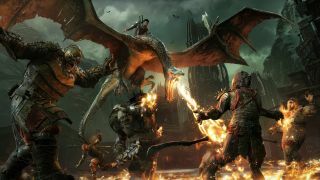 Middle-earth: Shadow of War takes place in the six to seven decades in between The Hobbit and The Lord of the Rings trilogy, a period Tolkien "never really wrote about." "All of a sudden, we've got 70 years that we can do some really interesting stuff with," Allen says. "Really for us, we want it to be bigger, we want the stakes to be higher, and we have this big time period to play with. That's fertile ground for any writer, and our writers really dug into it and had a lot of fun with it." The game promises to be an epic adventure – "epic feels like an overused word, but really that's what it is – it's war, right?" – and as a vessel for one of the most cherished IPs of all time, the director calls the endeavor equally scary and fun, especially the second time around. "Shadow of Mordor was pretty exciting for us as a studio," Allen says. "The response we got from it was overwhelming. "We knew we had made a good game, but we had no idea anyone else thought we made a good game. So being able to take that, and know the stuff that we wanted to do that we knew could have made it better, doing that and expanding everything else [in Shadow of War]. It’s really exciting." Middle-earth: Shadow of War will be available for Xbox One, Project Scorpio, Windows 10 PC (Windows Store and Steam), PS4 and PS4 Pro beginning August 22, though there's no word on pricing yet. According to Microsoft, Shadow of War will be available for Project Scorpio when the console launches this holiday.